The Edison K8 has been named a Tier 1 School! 90% of students made progress on 2018 MCAS and the BPS School Quality Index ranks Edison K8 in the highest performing of the Boston Public Schools. Welcome to the Edison K-8 School! The Thomas Edison K8 School serves children in grades K1 through 8 in an environment that is nurturing, engaging, and rigorous. 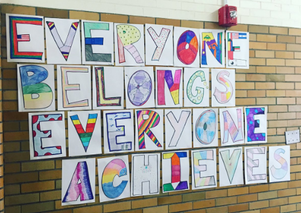 The Edison K8 School is committed to providing its students with a rigorous, inclusive academic experience in a safe, nurturing, inclusive atmosphere that creates a sense of belonging for students, families and staff. The Edison K8 is committed to harnessing the power of the arts as a way to drive student achievement. Edison students learn to read, write, compute and think through a high expectations curriculum that includes academic and arts instruction every day. The Edison School embraces the spirit of invention and experimentation that were the hallmarks of Thomas Edison. Our community is committed to the Five R’s: Responsibility, Respect, Resourcefulness, Righteousness and Rigor as values that will allow all our community members to be successful in whatever endeavor they choose to pursue. The Edison K8 School, part of the Boston Public Schools district, serves approximately 650 students in ten grades from pre-kindergarten to eight. It was formed in 2009 by the merger of the Edison Middle School, Hamilton Elementary School, and Garfield Elementary School. The school has a focus on the performing arts—drama, music, and dance—and has partnerships with many area organizations, including the Boston College, City Connects, Jackson Mann Community Center, Steppingstone Foundation, Open Circle, and Restorative Justice. Students and their families come from over 60 different countries and speak more than 20 different languages. Of the students the Edison serves, 83% qualify for subsidized lunch, 43% are English language learners, and 22% have special needs. The school is located at 60 Glenmont Road in the Brighton neighborhood of Boston. "Red Sox’s Dustin Pedroia and New Balance team up to provide low-income students with new clothing"
"On Valentine's Day In School, Cupcakes — And Lessons On Consent"
Did you know? We have Instagram! Follow us @EdisonK8School. ​Follow us @EdisonK8School on Twitter. We will be posting announcements, photos, and sharing events/news for our families and friends. Follow along with the twitter feed below and let's tweet! Copyright 2011 by the Edison K8 School. All rights reserved.